Large Arch Address Plaque with Name - - personalized three-line address sign with your name following shape of the arch top. Wall mount. Made in USA. Wall mount. 20"W x 13"H.
Three lines of personalization with the family name around top, address number in the center, and street name at the bottom. Line 1 (name) under the arch holds up to five (5) characters. Line 2 (street number) holds up to four (4) 4" numbers. Line 3 (street name) holds up to seventeen (17) 1.5" characters. Text is printed in all uppercase letters as shown. Also available in a larger size, a smaller size, and for lawn placement (see Related Products). 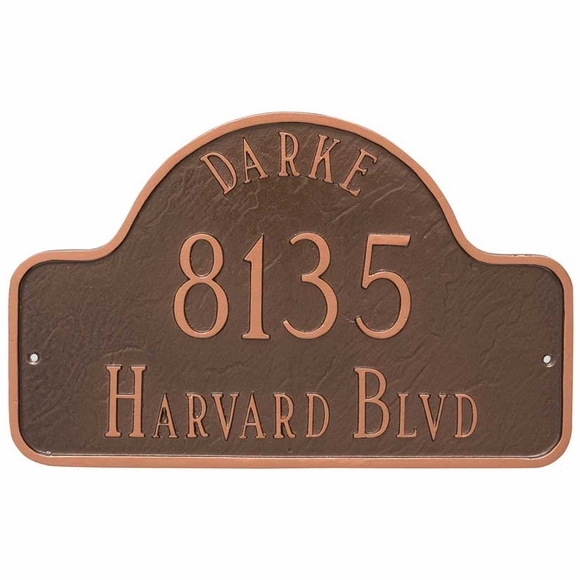 Personalized arch shape address marker includes a large house number in the center and surrounded by your name and the street name. Made in USA.